T.E.S is increasing in a spectacular way its entry and portion in the Egyptian as well as the global market in the field electro mechanical industries providing solutions for the industrial and constructions sectors, and is approaching its targets with an upward heading dynamic. Maintaining and improving with diligence the quality of its services, T.E.S manufacturing facilities are targeting to the full satisfaction of its clients in all fields of co-operation (quality of work, delivery time and cost of work). Gaining the trust of a satisfactory number of great international companies, T.E.S is boosting its competitive benefits, approaching at the same time new clients from the Egyptian and global owning companies. Our clients demands are always the most important guide for the improvement of our offered services. T.E.S manufacturing facilities have been trusted to produce metal products for nearly 30 years. 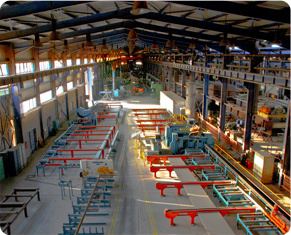 Located in a superior location in the south of Cairo very close to the main access roads to Egypt sea ports as well as to the oldest national steel mills provide a cost effective privilege to our customers.While our reputation for quality has remained unchanged since our founding in 1982, our capabilities and equipment are always expanding to stay ahead of modern demands. For 3 decades, T.E.S has been dedicated to providing its customers with the highest level of quality service. T.E.S Team has the technical expertise, qualified workforce and facilities to service our customersproduction line.